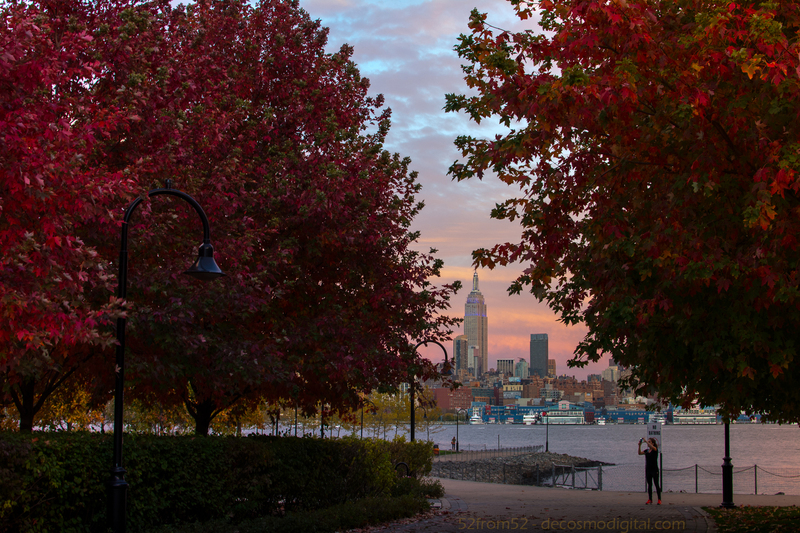 One of the many benefits of living in Hoboken is having easy access to its waterfront parks and paths. The waterfront provides a place to relax, socialize and or exercise in the midst of some beautiful views. If I had to point out one negative aspect about exercising on the waterfront, it would be that while running you regularly have to fight the urge to stop and take pictures. If you follow my Instagram you’ll probably notice most times this is a losing battle for me. This week I decided to take my Nikon out during the time I usually run to see if I could capture something that depicts my daily struggle. While moseying around Maxwell Park I noticed that many of the trees that were green just last week were now turning all different kinds of amazing colors. There were two trees that really stood out to me so I began trying to find a good angle to photograph them. As I shuffled around the trees I noticed that I wasn’t the only one that was giving them focused attention. Runner after runner stopped to fire off a picture “on the run” then carried on their way. Initially having runners photobomb my picture was very frustrating until it hit me, this is exactly what I do, so why not try to capture the moment? This week’s photo included a wide range of colors most of which required different exposure settings to reveal their vividness. The best tactic that I’ve found for recovering color when you can’t choose one exposure is via select post-production exposure adjustments. 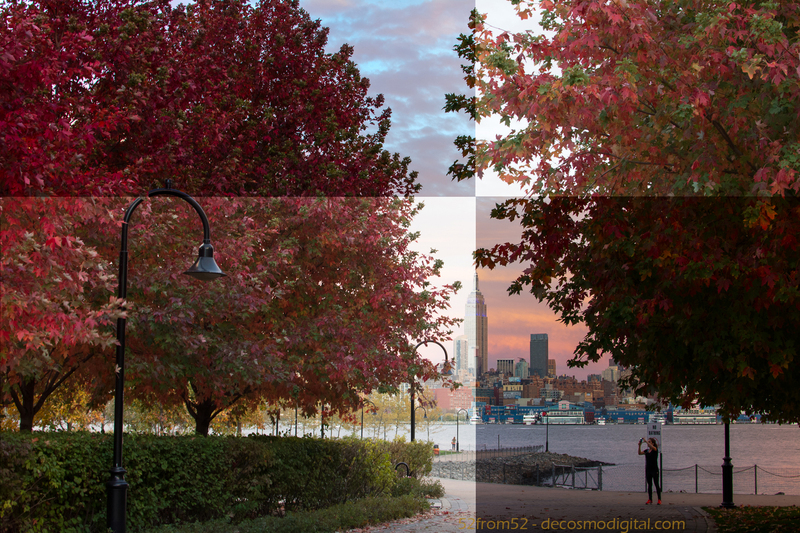 Although it’s possible to recover many colors after the fact you still have to select an in camera exposure which isn’t going to make that impossible. What I’ve found through experience and also read is that going with an underexposed picture allows for more recovery capabilities. Despite my own observation regarding underexposing, this week I rolled the dice and didn’t drop the exposure of my picture. To demonstrate what I’m talking about regarding exposure recovery I sliced up before and after sections of my picture to highlight the comparison. 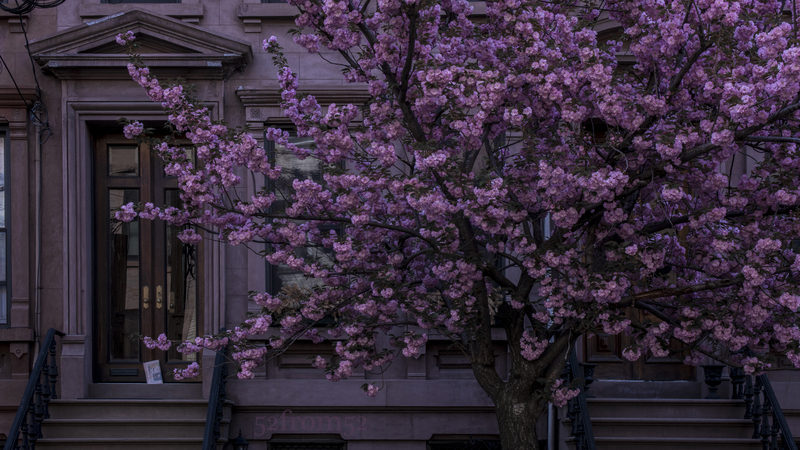 The most noticeable area that benefited from the exposure adjustment was the sky and empire state building. Without making the adjustments illustrated below the tree’s would have still had nice color but the entire sky would have been very washed out. In addition to having the right in camera exposure settings the other key setting which permits recovery capabilities is shooting in your camera’s RAW mode. For Nikon the raw mode is NEF format and it retains 12-14 bit data versus in JPEG where it retains only 8 bits. To read more about Nikon’s RAW format see the article linked below. Although each camera brand has it’s own RAW mode it’s fair to say that each would follow similar attributes and recovery capabilities. When I first started taking picture with my 5200 I went with just JPEG then after learning the value of RAW I did JPEG + RAW. Now to save space I only shoot in RAW format which still takes up a lot of space. So far the space limitation is one of the only negative that I’ve run into in regards to shooting in RAW mode. My 32GB card can hold about 875 NAF images while I can shoot 2000+ JPEG (fine) images. The other negative aspect of shooting in RAW is that there are some limitations on what you can use the edit the image. I recently found out that you can edit RAW images via Google+ and Snapseed which is really great for on the go editing. If you want to learn more about Google+ editing watch the below YouTube video from one of my favorite online photography resources “Camera Rec Toby”. If you have time I highly recommend clicking through Toby’s YouTube page, he is very informative.